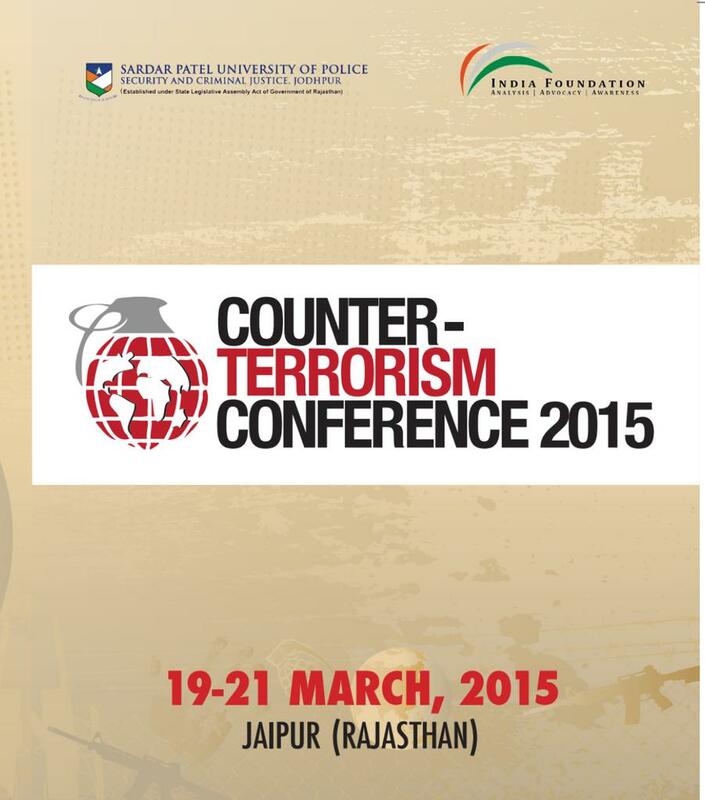 The 1st Counter-Terrorism Conference 2015 was held in Jaipur for three days from 19 - 21 March 2015.The conference was organised by India Foundation in association with the Sardar Patel University of Police Security and Criminal Justice, Jodhpur at Jaipur in Rajasthan. The theme of the Conference was "Integrated Approach to Counter-Terrorism." The focus of the deliberations was on exploring the contours of 21st century terrorism and sharing the Counter-Terrorism expertise. Some of the sub-themes on which the conference focused include 26/11 Mumbai Terror Attack, Talibanisation of Af-Pak region, New Caliphate in West Asia, Maritime Terrorism and Piracy, Chemical, Biological, Radiological and Nuclear (CBRN) Terrorism and Cyber and Space terrorism. The Conference acted as a global platform for eminent scholars, strategic thinkers, field experts and policy makers engaged in counter-terrorism activity from various governments, agencies, think tanks and academic and research institutions from all over the world. Union Home Minister Rajnath Singh, Rajasthan chief minister Vasundhara Raje, Former Union Home secretary GK Pillai, Former chief of Defence Staff of Sri Lanka Sarath Fonseka and Former chief of Army Staff of Nepal Rookmangud Katawal were among the speakers at the conference.